Find out how OpenFile.ca covered Toronto in 2011. Discover where the online site covered local news in the city and examine the types of stories the website reported on in each ward. –Each reference to geographic locations referenced in OpenFile.ca stories and photographs is indicated by yellow points, lines and polygons on the map. Click any of these features to see more information about the stories that referenced the location. –The blue lines represent City of Toronto Ward boundaries. Click inside any of the wards for a breakdown of what news topics were covered in the ward. –Zoom in and out to see locations in your neighbourhood that received news coverage. from May 11, 2010, until it went out of business on September 28, 2012. The geographic patterns of news coverage also vary by topic. The map showing the places mentioned in arts and entertainment stories and photos, for instance, looks different from the map of crime coverage. 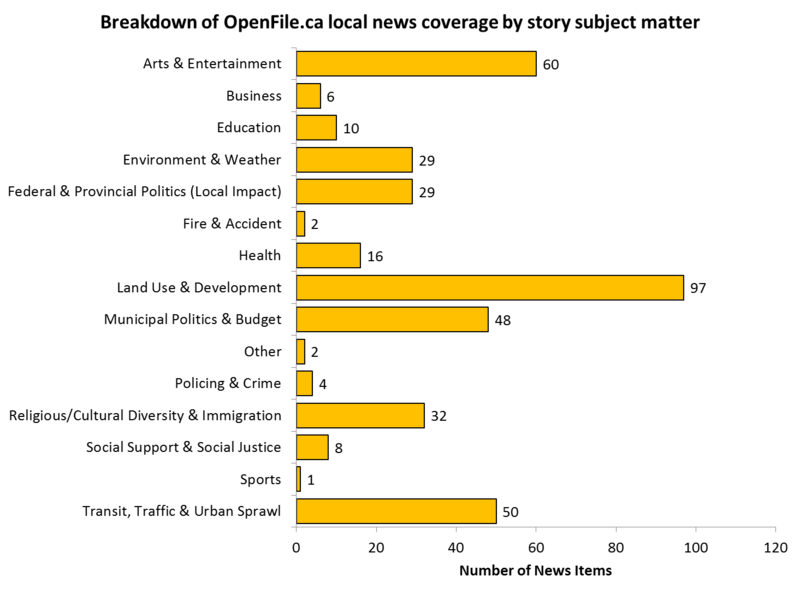 To explore the geography of news coverage by topic, click on the following links for the five most frequently mentioned news categories on OpenFile.ca.